With the world eagerly awaiting the upcoming wedding of Prince Harry and Meghan Markle and industry experts making their predictions on what gown Miss Markle may wear, we can’t help but to reminisce over the royal wedding of 2011. Prince William married Kate Middleton in Westminster Abbey on April 29th and not only did the world fall in love with the royal love story, but we also fell in love with her incredible wedding dress! 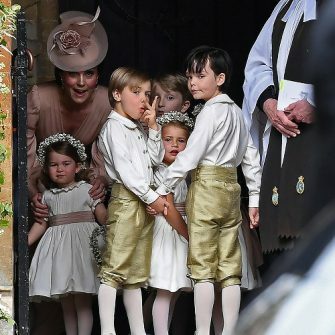 The infamous royal wedding dress was designed by Sarah Burton for Alexander McQueen, and featured a breathtaking combination of satin, lace and intricate detailing to make an iconic design that epitomized the Duchess’s elegance and sophistication. This gown cost a cool £250,000, but now you can get the look for a fraction of the cost at high street store H&M! Joining the likes of Topshop, Dorothy Perkins and French Connection, H&M is the latest high-street store to launch an affordable range of wedding and bridesmaid dresses that won’t break the bank. And lucky for brides-to-be, the Scandinavian retailer has launched a gown that is a pretty good dupe of the Duchess of Cambridge’s gown at the 2011 royal wedding. 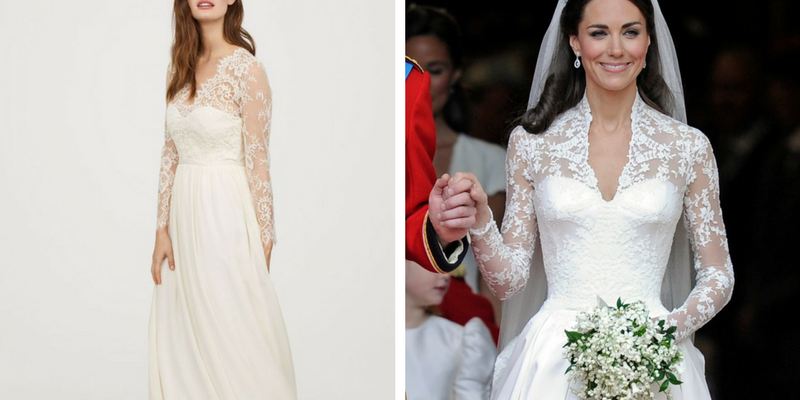 Featuring a similar scalloped lace v-neck, delicate long sleeves, boned structure and an A-line skirt, this gown is certainly a doppelganger! And what’s more, the price tag is also impressive, retailing at only £149/€170 leaving you lots of extra cash to splash on the rest of the celebrations! For many brides, the dress is a fundamental feature of their special day, but with the average cost of weddings soaring to £27,161, it comes as no surprise that couples are looking for ways to cut back. And whilst this gown is missing the 2.7m train that was seen on Kate’s luxury design, we reckon at £149 this H&M wedding gown is a steal! For inspiration, help and advice on searching for your dream dress, check out our recommended suppliers of bridal fashion in Northern Ireland and Ireland.